While this strange-looking mushroom has been called a "tree cancer" since it will eventually kill its host tree, it has attracted interest for centuries in fighting human cancer and other diseases. Chaga is one of the weirdest mushrooms you may ever see. A fungal parasite found on birch trees, Chaga is a hardened, blackened, crusty formation that looks like a bursting tumor. While this strange-looking mushroom has been called a "tree cancer" since it will eventually kill its host tree, it has attracted interest for centuries in fighting human cancer and other diseases. This interest in its medicinal properties has led to rampant harvesting of wild specimens -- threatening this ecologically-delicate species. Growing the mycelium of the Chaga mushroom under laboratory conditions provides an ecologically friendly alternative supply of this unique medicinal mushroom. 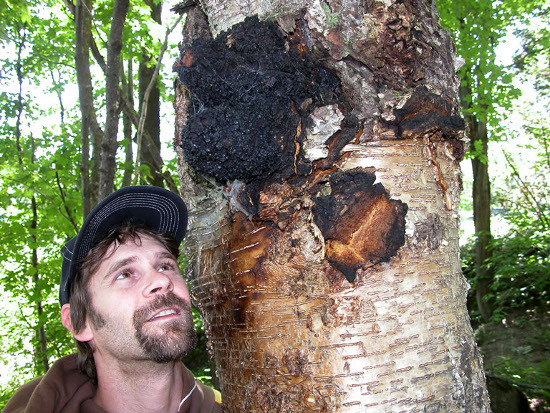 Mycologist James Gouin and a Chaga bursting through the bark of a birch tree. Chaga is one stage in the life cycle of Inonotus obliquus, a polypore mushroom that usually parasitizes birch and beech trees but may also be found on alder, chestnut, and hornbeam trees. The crusty blackened mass commonly called the Chaga "mushroom" is actually a sterile fungal body that precedes the actual spore-forming reproductive cycle of the Inonotus obliquus organism. This crusty black conk emerges over several years from inside the tree's cambium (the outer layer of actively-growing tree cells), pushing out and breaking through the bark. It is alien-like. You get the sense that the host tree is in deep trouble. Sometime after the Chaga conk matures, a fragrant spore-producing sheath forms obliquely, drops spores from its many tiny pores, and quickly disappears -- often quickly consumed by mycophagous insects, especially beetles and flies, which spread its spores to trees nearby. Estimates of Chaga parasitizing birch trees range from 1 in 20, to 1 in 15,000. This disparity can be explained simply: Chaga mycelium is inside many more trees than is obvious when the Chaga mushroom is visible on the outside. Foresters have yet to do a thorough study of how widespread Chaga infection is in temperate forests. Today, the market for Chaga is exploding. Nutritional supplement companies capitalize on Chaga's reputation as a medicinal mushroom. Interest in the West began when Aleksandr Solzhenitsyn's 1967 book Cancer Ward introduced his readers to Chaga's use as a traditional Slavic anti-cancer remedy. To date, however, there are no credible clinical studies showing its effectiveness in cancer treatment. Nevertheless, Chaga does contain compounds with enticing medicinal properties. Of particular interest are the ethanol-soluble lanostanic triterpenoid antioxidants, which have been detected in laboratory tests and corroborated in many peer-reviewed articles. Antioxidants mitigate the damaging effects of free radicals that harm tissue and interfere with DNA replication. A breakdown in the antioxidant capacity of cells is suspected to underlie various health challenges, such as inflammation, premature aging, and some cancers. Chaga supplementation resulted in a 54.9 percent (p < 0.001) reduction of H2O2 induced DNA damage within the patient group and 34.9 percent (p < 0.001) within the control group ... Conclusively, Chaga extract reduces oxidative stress in lymphocytes from IBD patients and also healthy individuals when challenged in vitro (Najafzadeh et al., 2007). Both these studies used similar methods to measure inhibition of free radicals. The take-home message here is that a room temperature water-ethanol extract of the sustainably-cultured Chaga mycelium is more powerful in its antioxidant effects when compared to a twice-cooked hot water extract of the increasingly scarce wild conks. Moreover, our initial research with the U.S. government's now-expired BioShield BioDefense program discovered a diluted mycelial-based, water-ethanol extract had high activity, in vitro, against Flu B and Flu A (H5N1) viruses, favorably comparing to the positive control pharmaceutical ribavirin (Stamets, 2007). Curiously, the water extract from boiling wild Chaga conks had no noticeable effect against these viruses. The problem with Chaga today is that widespread chopping of Chaga conks off of trees threatens a delicate ecological balance. Highly-motivated commercial foragers are quickly removing Chaga found near roads and hiking trails, making Chaga increasingly hard to find. Harvesters wielding hatchets and saws badly wound the trees they harvest from, exposing the fragrant and soft fungally digested wood to fungus-loving insects, potentially increasing the spread of insect-carried diseases. While a lack of forestry research on the topic has left no clear consensus in the scientific community about the long term effect of Chaga harvesting, there is sufficient cause for concern. Forest ecologists have a vested interest in understanding the long-term ecological role of Chaga, lest we learn later that the chopping off of wild Chaga accelerates beetle and other blights with untold downstream impact. This onslaught for short-term profit may inflict long-term ecological damage, though more research is needed to fully understand the scope and long-term impacts. A solution to over-harvesting Chaga for the nutriceutical industry is cultivation. Chaga mycelium is relatively easy to grow by using methods already practiced elsewhere in the mushroom industry. Its mycelium is initially an off-whitish color, deepening with age. It turns brown as its squirrel-like furry growth matures. Analysis of this mycelium shows that its anti-oxidant effect similar to that of wild-harvested Chaga. Moreover, Chaga is cleaner when cultivated under laboratory conditions. The pure Chaga mycelium has the distinct advantage of not carrying insects and their feces, and is less likely to absorb heavy metals that have been concentrated from air pollution. Moreover, cultivation is a sustainable practice, while the commercial harvesting of wild Chaga is making this mushroom harder to find. Chaga is significant in ethnomycology, forest ecology, and increasingly in pharmacognosy. Its long-term human use and cultural eastern European and Russian acceptance should awaken serious researchers to its potential as a reservoir of new medicines, and as a powerful preventive ally for protecting DNA. For now, I hope that the medicinal demand for Chaga can be tempered by the knowledge that it can be sustainably grown -- without the rampant scarring of the forests. I recommend reading the fall 2012 issue of FUNGI Magazine which focuses on the ecology and cultural impacts of the Chaga phenomenon.